Below is what you will hopefully find useful in finding out more about your body’s pH and how to test it. There are different opinions about optimum pH and this is one of them. Nevertheless, there is a strong and growing acceptance that we are, in general, over acidic and that excess acidity is the root cause of many (if not all) of the so-called aging diseases. Please Note: If you are not interested in the theory of pH balance and just want to find how to do urine pH and saliva pH tests then please scroll down to that section towards the bottom.“When you drink alkaline water, you are drinking water with excess oxygen, not in the form of O2, but in the form of OH- which is very stable because it is mated with positively ionized alkaline minerals. Two of these hydroxyl ions can form a water molecule (H2O) and give out one oxygen atom. Watch Here Dr. Young being interviewed on CNN news. ” Thus the saliva pH parallels the extra cellular fluid … pH paper test using saliva represents the most consistent and most definitive physical sign of the ionic calcium deficiency syndrome … The saliva pH of the non-deficient and healthy person is in the 7.5 to 7.1 slightly alkaline range. The range from 6.5 which is weakly acidic to 4.5 which is strongly acidic represents states from mildly deficient to strongly deficient, respectively. Carl J. Reich, M.D., Gilliland Printing Inc., Arkansas City, Kansas, 1996.
pH Balance – What is the Healthy pH Range? The pH scale ranges from 0 (the highest acidic) to 14 (the most alkaline). A solution with a pH of 7 is neutral. At pH 7, water contains equal amounts of H+ and OH- ions. Substances with a pH of less than 7 are acidic because they contain a higher concentration of H+ ions. Substances with a pH higher than 7 are alkaline because they contain a higher concentration of OH-. The pH scale goes from 0 to 14 and is logarithmic, which means that each step is ten times the previous. In other words, a pH of 5 is 10 times more acid than 6, 100 times more acid than 7 and 1,000 times more acid than 8. In this light, you can see how a slight change in your pH value can have a great impact on your internal environment and, ultimately, your health. When healthy, the blood pH is 7.365, the pH of spinal fluid is 7.4, and the saliva pH is 7.4. This ideal blood pH measurement means it is more alkaline than acid. In the absence of oxygen, glucose undergoes fermentation to lactic acid. Our bodies simply can not fight disease if our body pH balance is compromised. Not only are you more susceptible to infections such as colds and the flu but also degenerative diseases are promoted if your pH is consistently acid. See Below on How to Use Your pH paper for Best ResultsVirtually all degenerative diseases including heart disease, arthritis, osteoporosis, kidney and gall stones, and tooth decay are associated with excess acidity in the body. While the body has a homeostatic mechanism that maintains a constant pH 7.4 in the blood, this mechanism works by depositing and withdrawing acid and alkaline minerals from other locations including the bones, soft tissues, body fluids and saliva. Therefore, the pH of these other tissues can fluctuate greatly. The pH of saliva offers a window through which you can see the overall pH balance in your body. Minerals with a negative electrical charge are attracted to the H+ ion. These are called acid minerals. Acid minerals include: chlorine (Cl-), sulfur (S-), phosphorus (P-), and they form hydrochloric acid (HCl), sulfuric acid (H2SO4), and phosphoric acid (H3PO4). Minerals with a positive electrical charge are attracted to the negatively charged OH- ion. These are called alkaline minerals. Nutritionally important alkaline minerals include calcium (Ca+), potassium (K+), magnesium (Mg+), and sodium (Na+). (Cancer patients tend to have an excess of sodium. – Gerson page 97). To determine if a food is acid or alkaline, it is burned and the ash is mixed with water. If the solution is acid or alkaline then the food is called acid or alkaline. Ash is the mineral content of the food. Also, while it is commonly understood that the body needs calcium to build bones, what is not generally known is bones are a complex matrix of many different minerals and if all the required minerals are not present then strong bones cannot be built. There are at least 18 key bone-building nutrients essential for optimum bone health. The implication is that it is easier to destroy bone through excess acidity in the body than it is to rebuild bone. Furthermore, as farm soils become depleted of many trace minerals the foods grown on these soils contain less and less of the required nutrients. At last count, the human body requires 90 different nutrients for optimum health, and the list is growing year by year. How does this relate to body metabolism? Basically, if the body fluids are acid they will seek alkaline minerals to react with – such as sodium, potassium, zinc, iron, calcium. These are found in the liver, muscles, ligaments and bones, etc., if too little is available from the diet. But why should this happen? Effectively, all the body’s internal fluids are designed to be slightly alkaline, such as interstitial fluid, cerebrospinal and lymphatic fluid, liver bile and so on. The only exception to this is the hydrochloric acid produced by the stomach. While our bodies are designed to be alkaline, cells produce acid as a by-product of their normal activity. The acid waste matter thus produced is reduced to carbon dioxide and water which are excreted harmlessly from the body. When food is consumed and metabolized, however, not all of it is used up. A residue remains and this has been called ash (and perhaps the major area of disagreement in this subject is over the classification of foods into acid-ash forming and alkaline-ash forming foods). Digestion oxidizes foods in much the same way as if they were burned except that it involves enzymes operating at low temperatures; a lemon, for example, will break down into carbohydrates that will further break down into carbon dioxide and water leaving a residual alkaline ash consisting of minerals salts such as sodium, potassium and calcium etc. So while a lemon will taste acid and present and acid pH if tested raw, its ash will be alkaline and so will its effect on the body. Proteins on the other hand leave an ash consisting of phosphates, sulphates and nitrates (from the phosphorus, sulphur and nitrogen that proteins contain). These are all acid. The net effect of protein consumption (whether from animal or vegetable sources) is to increase acidity. The body has to rid itself of its acid wastes. This type of acid ash cannot be eliminated through the lungs as carbon dioxide and water in the same way as cellular metabolism. Instead the body has to buffer the ash with alkaline substances in order to neutralize it. Buffering takes place both inside and outside the cell, the majority of the buffering occurring in the blood itself. Clinical research by Dr M T Morter (Arkansas, USA) has shown that if the anabolic urinary and salivary pH (measured immediately upon awakening) is below 6.8, we can be relatively certain that digestive support must be provided. Controlled clinical studies by Dr Paul Yanick (Pasadena, USA) have confirmed Dr Morter’s findings and recorded that intracellular assimilation of nutrients is significantly decreased when the anabolic pH is below 6.8. > However as both these researchers have shown, supplementing the diet with appropriate alkalizing agents was highly beneficial in elevating the systemic pH by replenishing the alkaline mineral and enzyme reserves. Since systemic deficiencies show only in the last instance in the digestive tract, practitioners should not wait until the signs and symptoms of poor digestion become evident. From a preventative perspective, compensation should be made when symptoms are minimal and the anabolic pH is below 7.4 after an Alkaline Load Test (see “Correlative Urinalysis” by M T Morter). Diets which are high in protein, fat and carbohydrates and low in greens and raw food, stress the digestive mechanisms, inhibiting proper digestion and overloading the immune system with incompletely digested macromolecules and toxins. These digestive disturbances are aggravated by the typically high intake of food additives, pesticides and stimulating foods that are common in the Western diet. Also in a effect to solve the problem of worsening public water quality, more and more people are turning to water in plastic containers. What is usually not realized is that virtually all bottled water is highly acidic and missing the essential alkalizing minerals. To perform this simple test, all you need is a roll of testing pH paper (preferably pHydrion test paper), a plastic spoon and some fresh saliva. The pH strips with a range of 6.0-8.0 pH are best for people who to test their saliva. This range is where most healthy people, who are working at becoming alkaline, will find their salivary pH. 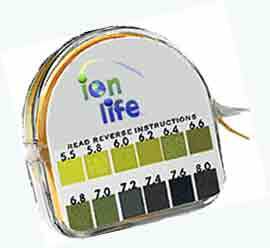 The test uses a pH-sensitive, color-coded test strip to reveal your body pH balance status. For the saliva test: – Be sure not to eat, drink, or brush your teeth for 30 minutes prior to the test – Swallow a couple of times to clear the mouth and stimulate new saliva – Then discharge some saliva into a PLASTIC spoon (it is recommended NOT to touch the pH paper to your tongue due to the chemicals in the paper. Tear off a one-inch strip of pH paper, place into saliva and compare the color of your immersed pH paper with the color chart provided on the pH testing roll. The lower your pH value below 7.0, the greater your degree of acid stress. Continue testing and recording your pH for a few weeks – first thing in the morning, afternoon and at bedtime (This will show your body pH trend). While generally more acidic than blood, salivary pH mirrors the blood ( if not around meals ) and is also a fairly good indicator of health. It tells us what the body retains. Optimal pH for saliva is above 7 pH. A reading consistently lower than 6.8 is indicative of possible insufficient alkaline reserves. After eating, the saliva pH should rise to 7.8 or higher. Unless this occurs, the body has alkaline mineral deficiencies ( mainly Calcium and Magnesium ) and will not assimilate food very well. To deviate from ideal salivary pH for an extended time invites illness. If your saliva stays between 6.8 and 7.2+ pH all day, your body is functioning within a healthy range. If the early morning salivary pH remains above 6.8, people usually see many of their problems disappearing. The pH of the urine indicates how the body is working to maintain the proper pH of the blood. The urine reveals the alkaline building (anabolic) and acid tearing down (catabolic) cycles. The pH of urine indicates the efforts of the body via the kidneys, adrenals, lungs and gonads to regulate body pH balance through the buffer salts and hormones. Urine can provide a fairly accurate picture of body chemistry, because the kidneys filter out the buffer salts of pH regulation and provide values based on what the body is eliminating. Urine pH can vary from around 4.5 to 9.0 for its extremes, but the ideal range is 6.5 to 7.0+. Urinary pH tends to be lower in the morning and higher in the evening. The pH of the urine can vary widely. The pH of urine is also affected by the biochemicals that the body is eliminating. These include biochemicals such as excess minerals, vitamins, and products of metabolism and also include drugs and toxins being eliminated by the body. all the biochemical activities going on in your body. Just a quick word of support for testing body pH….I used to think it was off the wall and kinda weird, but once I tried it and got into the habit of keeping track, it turned out to be the best way for me to gauge what’s happening in my body. I’d recommend it to anyone. If anyone is interested in giving it a shot, you can get great ph strips here. Hope I helped someone find how beneficial it can be.